Alba Cottage is a quintessential ‘chocolate box’ retreat for couples nestled in the heart of the welcoming village on Newton on the Moor. 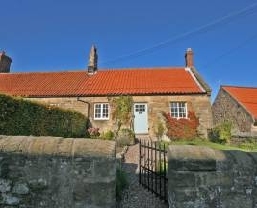 This 18th century stone-built cottage sits at the end of a terrace and simply oozes charm. It has been luxuriously furnished throughout with so much thought and attention to the finer details. There are many original features adding to its character including a magnificent range providing the perfect focal point within the homely sitting room; idyllic to snuggle in front of and watch the flames dance in the open fire. To the rear of the property there is a large and fully enclosed garden boasting uninterrupted open rural views. A friendly greeting regularly awaits visitors to Newton on the Moor, renowned for its award winning pub and restaurant only a mere gentle stroll from Alba Cottage. The village lies around a half mile on the west side of the A1 giving easy access to explore this stunning region. The ancient market town of Morpeth is around 12 miles south, and the historic town of Alnwick, which also offers many facilities including indoor swimming, a cinema / playhouse and an abundance of excellent shops, restaurants and tea-rooms is only 5 miles north. Alnwick Castle and Gardens, with its grand cascade waterfall and restaurant incorporated within the largest tree house in Europe are popular visitor attractions. 10 miles west are the wild, heather-clad Simonside Hills and where the picturesque small town of Rothbury nestles within the Coquet valley. Visit the 1,000 acres estate of Cragside, an exquisite National Trust property close by. Druridge Bay is renowned for its glorious sweep of golden, sandy beach and the nearby Country Park offers a Nature Sanctuary and visitor centre, along with water-sports on the nearby Ladyburn Lake only 8 miles east, making Alba Cottage the perfect base to explore both the Northumbrian countryside along with the twenty mile expanse of spectacular seashore this region is proud to have designated as an Area of Outstanding Natural Beauty. Bathroom: with shower over bath. Separate WC and wash basin. Large, enclosed garden at rear with picnic table and benches boasting uninterrupted views across open countryside. Parking. Railway Station Distance: 7 Miles, Railway Station: Alnmouth. Starting from £285 per week low season to £430 per week peak season. Check for late deals.